From the minute she steps into the basement of First African Presbyterian Church on Monday nights, Kaitlin Bushinski is in motion. The second-year master of social work student begins checking in patients at that evening's free clinic while her peers facilitate introductions among student volunteers, many of whom spend their days in different parts of the University of Pennsylvania's campus. Bushinski is one of three social work student coordinators for United Community Clinic (UCC), a weekly health clinic run by University of Pennsylvania students in the schools of medicine, nursing, dental medicine, and social policy and practice. For three hours each Monday, students meet with about a dozen residents of Philadelphia's East Parkside community to address health concerns ranging from diabetes to depression. Patients typically speak with medical, dental, and nursing students to discuss specific health problems, while social work students assess any psychosocial concerns, suicide red flags, or signs of domestic violence. Social work students also talk to patients about their barriers to health care, Bushinski says, and explore options for finding a primary care provider. "From the social work perspective, [the clinic] is about considering the person in their environment and asking the deeper, more critical questions, not making assumptions," she says. "We [social work students] have the knowledge and training and language to bring those concerns to the table and that creates better outcomes for our clients." In social work programs across the country, students like Bushinski are signing up for multidisciplinary initiatives to gain clinical experience and interact with other professionals-in-training. Students now have a variety of options to choose from, thanks to a surge of creative partnerships among academic departments and community agencies. Take, for example, the medical-legal partnership model developed in 1993 by Boston Medical Center. Medical-legal partnerships seek to unite professionals in the legal, medical, and public health communities through their shared interest in the social determinants of health—the circumstances in which people live, work, and play throughout their lifetime. More than 250 health care institutions in 36 states have adopted medical-legal partnerships, according to the website for the National Center for Medical-Legal Partnership. 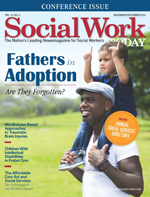 Social workers are not always included in the model, but programs like the Health, Education, Advocacy and Law (H.E.A.L.) Collaborative in Newark, NJ, have embraced the social work field for its emphasis on systems theory. Since March 2013, the H.E.A.L. Collaborative has brought together law students, social work students, and medical residents to work on cases referred to them by the outpatient center of a local medical practice. The partnership is a joint project of Rutgers' School of Law–Newark and New Jersey Medical School. "Many law students come in focused on legal issues, specifically, 'What is the legal problem and how am I going to resolve it?' Social work students come in with a broader perspective," says Jennifer Rosen Valverde, JD, MSW, a clinical professor of law and the collaborative's legal director. Valverde describes the common scenario of a child experiencing asthma attacks because of a rat infestation at home. Doctors can treat the symptoms as they occur, but they can't prevent future attacks until the family finds a cleaner, safer place to live. Similarly, a child with epilepsy may display symptoms that make it seem like they are misbehaving at school, leading to punishment from misinformed teachers and administrators. Students from multiple specialties can pool their knowledge to help families connect those dots, Valverde says, and put supports in place that minimize undesired outcomes. "We can't do what we need to do on behalf of children and families without each other," she says. In North Carolina, social work students partner with nurses in faith-based communities through the Congregational Social Work Education Initiative (CSWEI). The unique program, offered by The University of North Carolina at Greensboro and North Carolina Agricultural and Technical State University, serves as a mobile field placement in which students travel to nearby churches, agencies, and community centers where nurses are based. Fourteen students participate in CSWEI each year, seven from the bachelor of social work program and seven from the master's program. The initiative lets clients visit a trusted resource like their church instead of navigating the area's fragmented social services system, says Program Director Fran Pearson. CSWEI students complete a 40-hour training at the beginning of the program to prepare for common client interactions. They then visit a minimum of two community settings per week, where they partner with parish nurses to identify clients' physical and mental health needs, says Principal Investigator Jay Poole. A student may meet with a member of a local congregation who is experiencing anxiety one day, for example, and a homeless person in need of crisis intervention later in the week. "It's definitely a team approach," Poole says. "Nurses follow the students to make sure people's needs are met in a very holistic way, that they're looking at the whole person and not separating the physical needs from the mental." While most multidisciplinary student partnerships focus on learning by doing, many include a classroom component to help participants process their experience. At the Loyola University Chicago School of Law, students participating in the Health Justice Project, a medical-legal partnership clinic, meet about two hours each week to revisit specific cases. These case rounds give students a chance to exchange feedback and learn about community resources or legal avenues that aren't part of their own curriculum, says Supervising Attorney Allyson E. Gold. This classroom time also reinforces the value of other professions' contributions to a case, a reminder she finds particularly pertinent to aspiring lawyers. "Unless they've worked with social workers directly, most law students and probably most lawyers don't have a full appreciation for the specific training that a social worker has," Gold says. At Rutgers, law and social work students also meet weekly to revisit cases and discuss emerging themes. These hour-long discussions are loosely structured, Valverde says, so that members of the H.E.A.L. Collaborative can bring up the issues most important to them that week. Often, the conversation turns to ways students can better partner with their cross-disciplinary colleagues, both now and in the future. "It's critical [to work collaboratively] at the educational stage when people are still learning," Valverde says. "Collaboration is a skill that must be taught and practiced. If you wait until people are done learning about their profession, they can take on a very single-minded perspective." Indeed, social work students benefit from participating in multidisciplinary initiatives while still in the educational environment. Working closely with future lawyers, doctors, and nurses introduces them to the language and thought processes often used in those professions. Similarly, non–agency-based partnerships like CSWEI teach them to handle diverse mental health and psychosocial issues in a variety of populations while receiving regular supervision. "With CSWEI, students have such a diversity of clients that really shapes them in terms of what they're able to experience with their nurse partners, and what they're able to do after graduation," says Pearson. As for Bushinski, she says that participating in UCC has taught her important skills like problem solving and de-escalating tense situations, while working respectfully with others to get clients what they need. She has also discovered a fondness for multidisciplinary settings, taking on a second-year field placement that allows her to interact regularly with hospital staff. Wherever life takes her after graduation, Bushinski says she will leave Penn as a more competent and self-assured professional because of her time at the clinic. "Just looking back on my time there and seeing what I and my team have accomplished, I find that I'm more confident in everyday life and more able to handle everyday challenges—whatever job or profession I choose to pursue." — Joelle Ruben, MSW, is a Washington, DC-based freelance writer.